What a thriller of a relay with 8 teams with the chance to win with 10-15 minutes left to run! 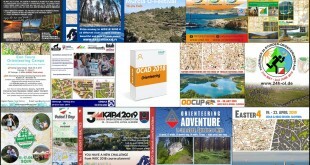 The course offered both tricky orienteering, varied difficulty, decisive forking and some interesting routechoices. First the usual overview of the race development with all teams compared. With so many teams battling for victory, this gets too complicated to understand, so below this is broken down into one illustration for each team in the medal battle. Let’s start of with the battle between Norway and Switzerland – on paper the two main favourites for the gold medal, and in the end also the gold and silver medalists, although a small mistake towards the end could have sent them tumbling down to a place outside the podium. 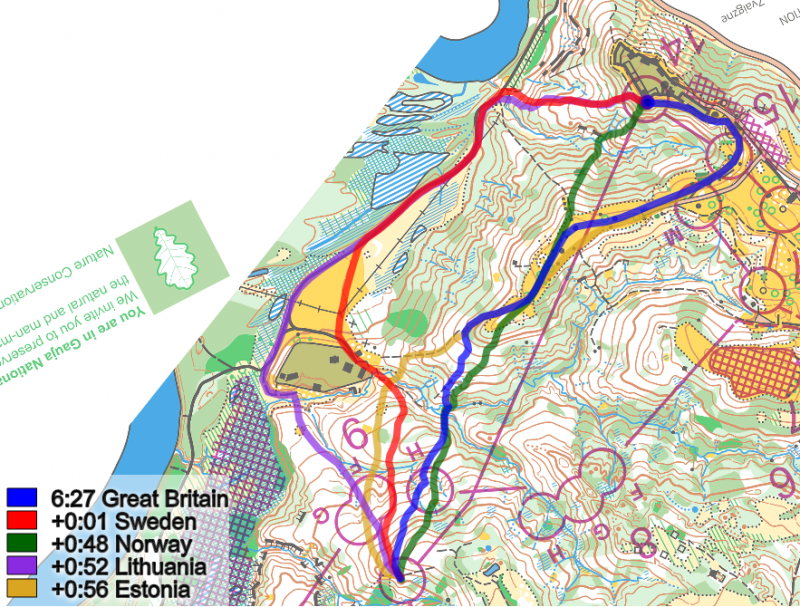 On the first leg Gaute Hallan Steiwer, replacing Olav Lundanes on short notice, managed to run a very good race for Norway, delivering the World Champion from the middle distance Eskil Kinneberg close to the lead after the first leg. Hallan Steiwer did not run a very good long leg (green route below, lost 46 seconds to the best split time of Spain), but good enough to make his job. Florian Howald for Switzerland on the other hand run a quite good leg, but then simply forgot the control and had to run back to take it (one of the red routes below, lost 1:35 to the best split-time of Spain – the route to the left would however have been quite good without this mistake). This cost Howald more than a minute – a gap of a minute which Hubmann never managed to close on the second leg. Hubmann started well, catching half of the gap, and did have the chance to close all of the gap to Kinneberg as Kinneberg did not take the best route on the long leg, but with Hubmann lost even more time on this leg. 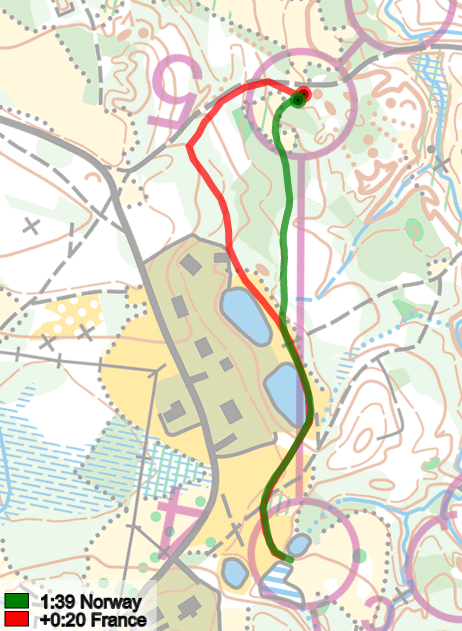 The two green routes below belong to Kinneberg (+48 seconds) and Hubmann (+1:05), Kinneberg running the leftmost going furthers down in the valley. Thus the gap was again 80 seconds at the end of the leg. 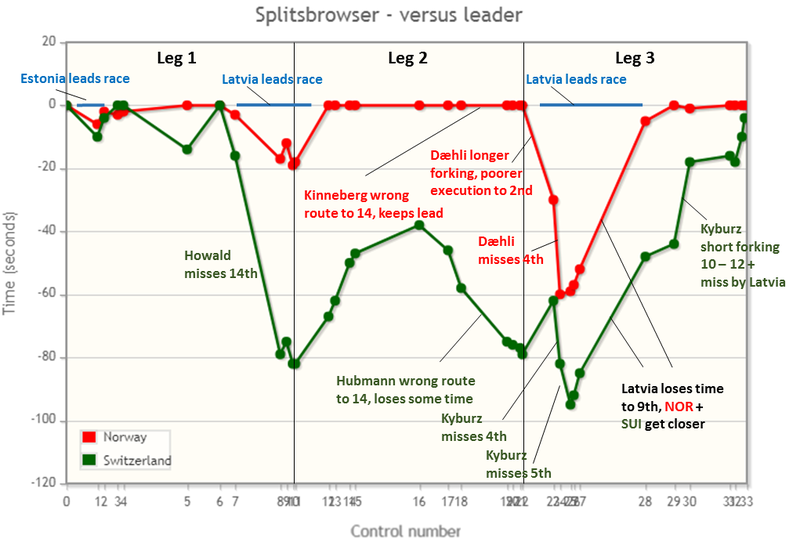 Thus Norway had again managed to start the last leg with a significant gap to Switzerland, as in the two last WOC-relays. 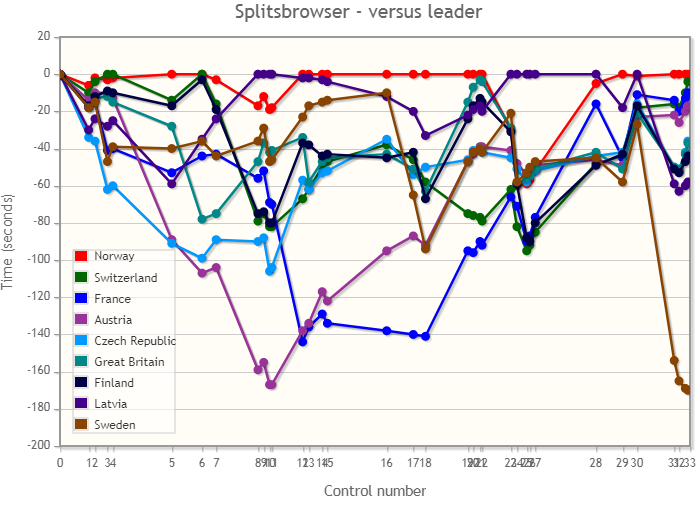 The difference from earlier years was that Norway was not alone in the lead, but instead had several other teams just behind. The difference from earlier years was that Norway was not alone in the lead, but instead had several other teams just behind. 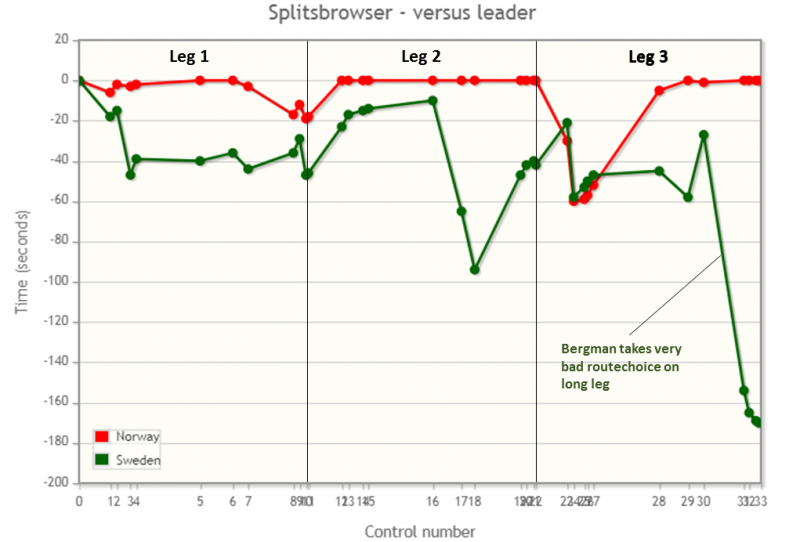 At the start of the last leg Switzerland’s Matthias Kyburz (forking A, one of the blue lines below, 4:39) had a somewhat shorter forking than Norway’s Magne Dæhli, and Dæhli in addition did not have the very best execution (one of the red lines, loses 47 seconds to Switzerland – forking is probably around 15-20 seconds longer but can be performed well as Sweden’s Gustav Bergman proves). The gap is now down to around 30 seconds – and then Magne Dæhli misses 30 seconds on the 4th control, running at the wrong side of a small pond, and everything is ready for Kyburz to close the gap! But Kyburz does a similar miss on the 4th control, and catches only 10 seconds on Dæhli. 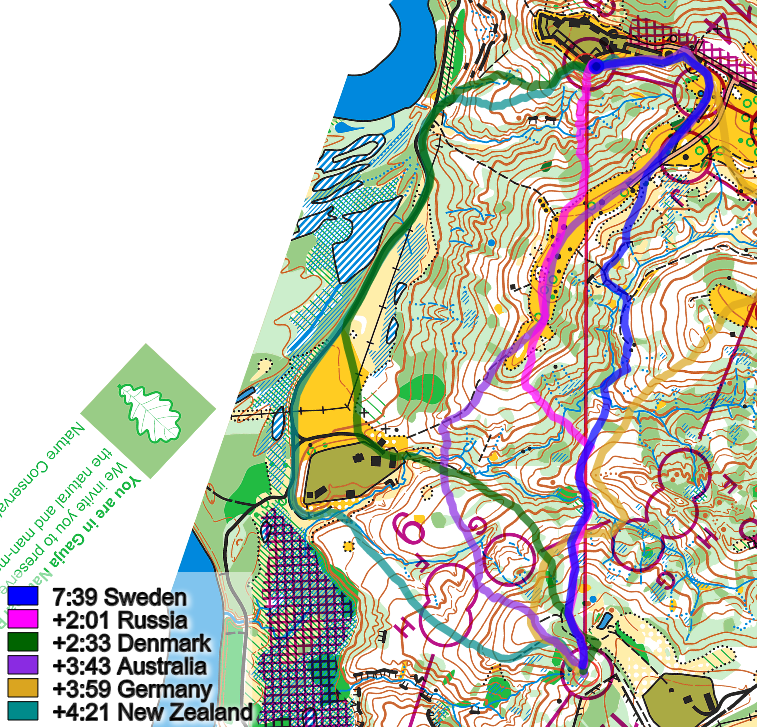 And then Kyburz has another non-optimal route, losing some more seconds to Norway. 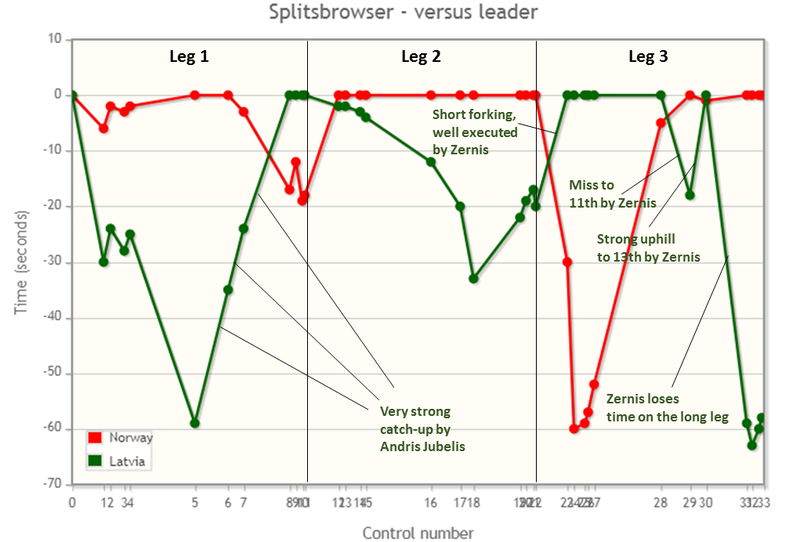 This gap of around 30 seconds is quite constant through several controls – including two forked controls – until Kyburz catches a lot on Dæhli on the leg before the last routechoice-leg. On this leg Kyburz catches 27 seconds on Dæhli, nearly up in the back of the Norwegian – now only 17 seconds behind. It looks like Dæhli loses nearly all of it the last meters into the control. 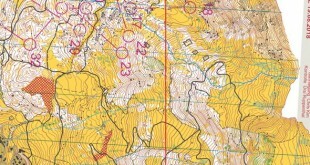 Is Dæhli getting tired, or has he just understood that the next leg – the long leg – is crucial and that it is vital that he chooses the correct route here and takes his time to make a correct choice? 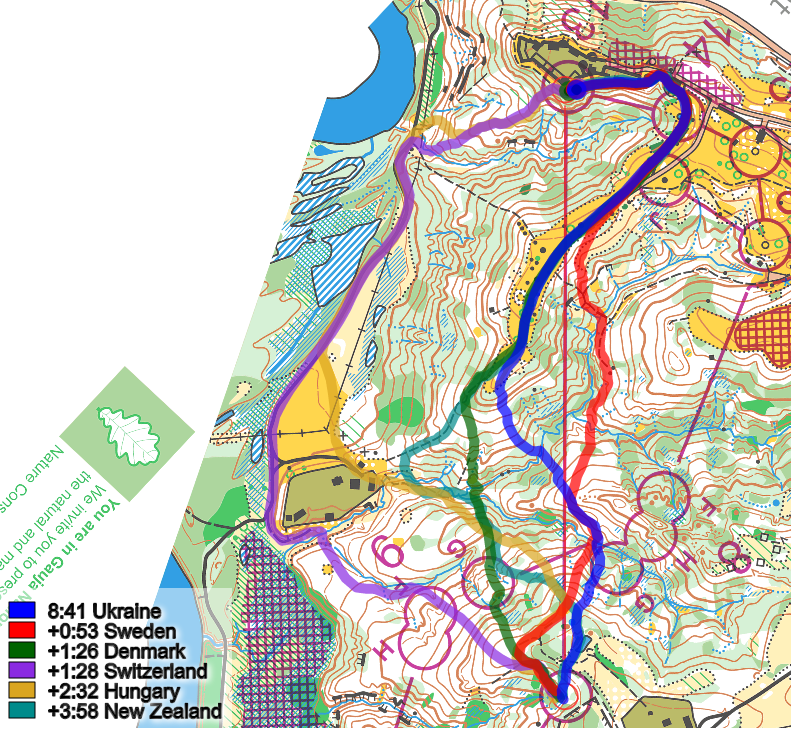 On the long leg Dæhli takes a straight option while Kyburz runs left down to the road and up the slope again. 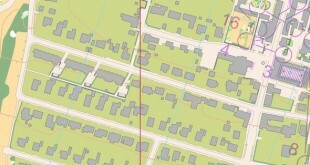 Kyburz’s time is 6:19, Dæhli’s one second faster. Here Kyburz uses his strength – running fast on roads while Dæhli takes a choice which is probably better for him. Based on the previous legs these two routechoices are nearly equal, maybe with a slight edge to Dæhli’s choice, although it is more tricky to execute well. And thus the race is decided. Dæhli’s gap of 16 seconds is enough to take home the Gold medal for Norway. Here is a replay of the last part of the relay. 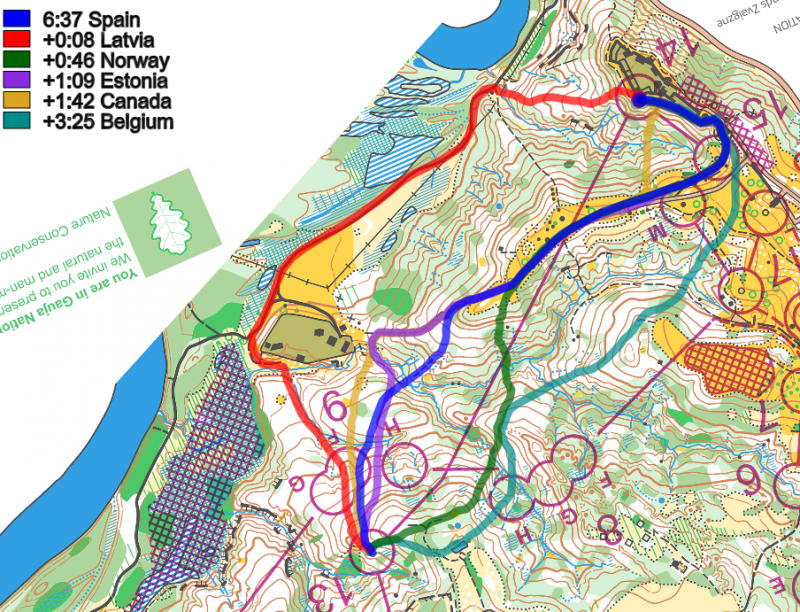 France’s Rio on the first leg did a good first leg (his miss on the 6th control was not too costly in the end), but Bassed on the second leg did a big mistake which gave a 2:20 gap up to the leaders from Norway midway through the second leg. 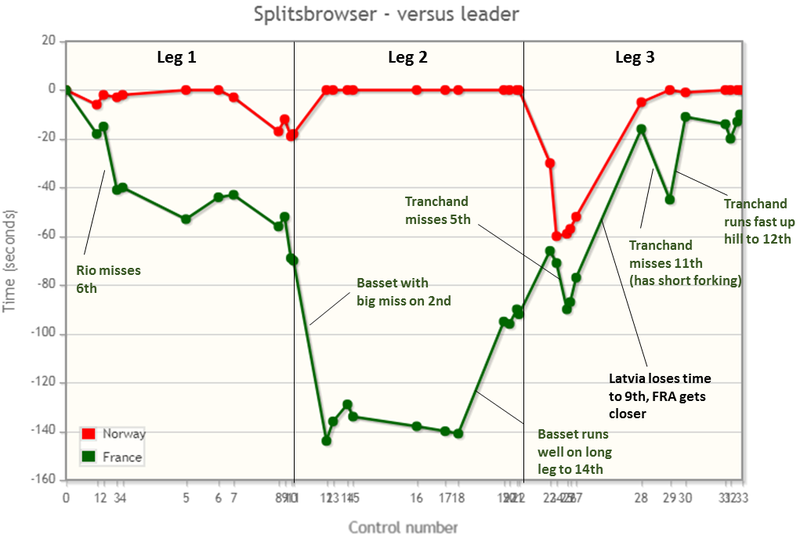 However, Basset ran a good long leg, catching time on the leaders and delivering last leg runner Tranchand at 1:30 behind the leaders – a good position for an offensive Tranchand. Tranchand runs incredibly fast, but misses both the 5th and the 11th control. He is saved by a short forking to control 11 though and only loses around 30 seconds to the top teams, and at the start of the long leg he is nearly up there with Switzerland. Tranchand runs incredibly fast, but misses both the 5th and the 11th control. Tranchand doesn’t run faster than Kyburz in the end, but is faster than everybody else, and wins bronze for France this way. 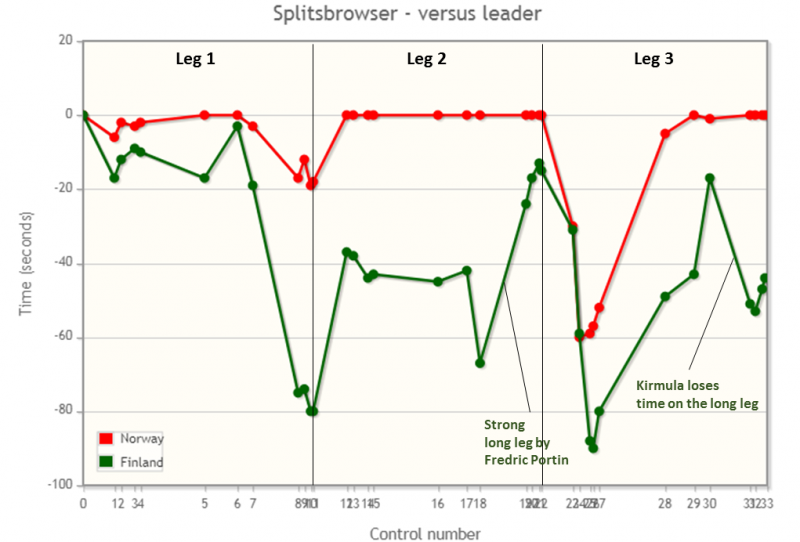 Tranchand has the best leg time on the last leg with 33:51, some seconds faster than Matthias Kyburz and more than a minute faster than Norway. 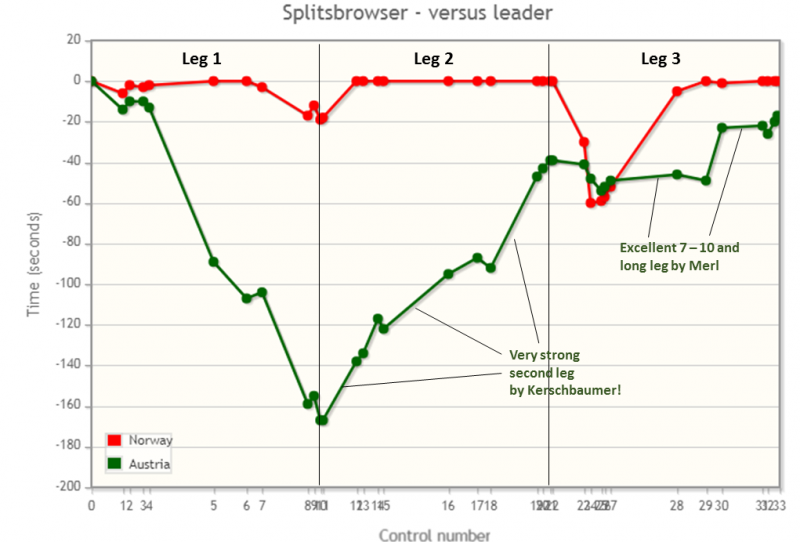 Austria’s success was mostly part to a fantastic leg by Gernot Kerschbaumer on the second leg – and Robert Merls strong finish. His time of 33:50 was the fastest of the day, 1 second faster than Tranchand on the last leg – and 1:03 faster than Portin who was second fastest on the second leg. 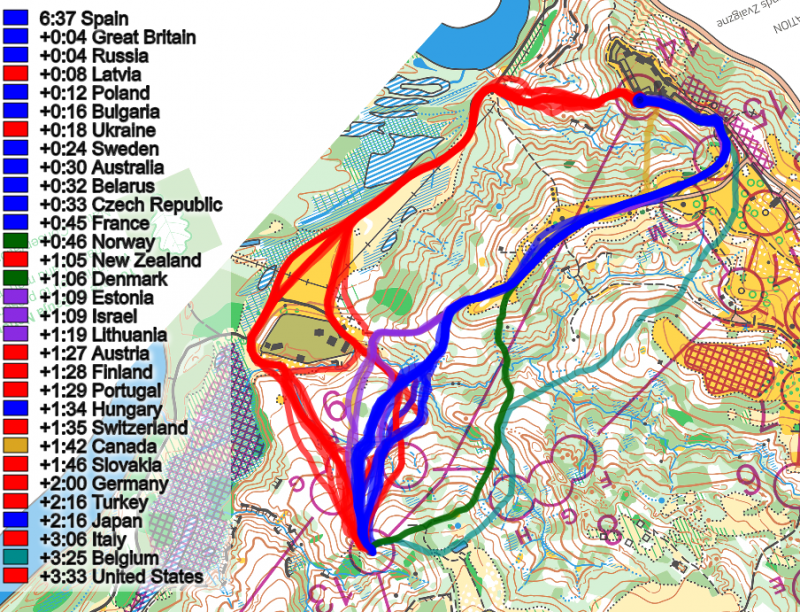 Robert Merl on the last leg also did an excellent job, securing 4th place – best ever WOC placement – for Austria. 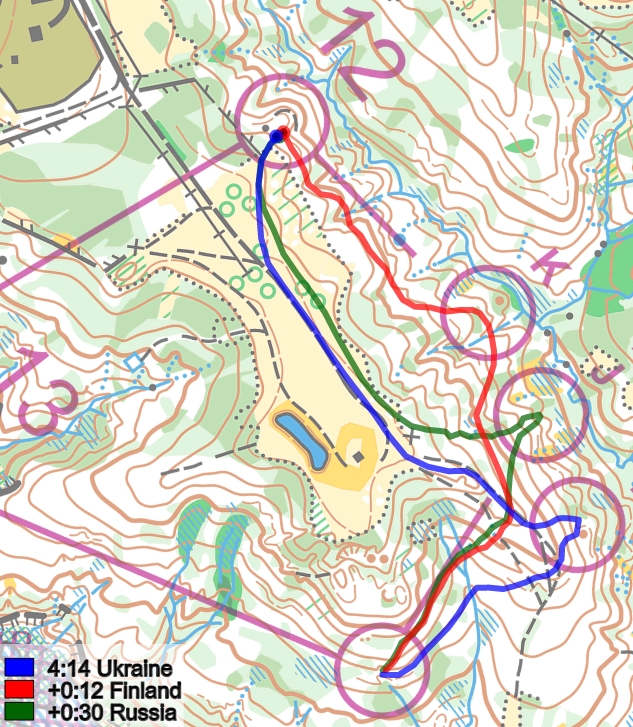 Czech Republic’s race development was similar to Austria’s, but with much more consistent performance, losing 1:40 at the first leg which Nykodym reduced to 40 seconds on the second leg. Kral was not strong enough to run with Kyburz in the end, and Czech Republic finished 5th. Great Britain was all the way up in the lead after two legs after another great run by Kris Jones (exactly the same job he did at the Sprint Relay). Last leg runner Ralph Street did however not manage to keep up with Norway, and in the end Great Britain lost some places. Finland had a very similar race development as Great Britain – with Fredric Portin the man of the day, running a very good second leg. If there was a prize for the most impressive team performance of the day, that would probably go to Latvia. The home country did such a great job at the lead of the relay almost all the way to the finish that it is a pity that it even ended outside the podium. The first real weakness of the Latvian team was Zernis’ miss at the 11th control. A somewhat shorter forking saved Zernis, and he was still nearly in the lead with Norway’s Dæhli after the miss, actually looking stronger in the uphills. If Zernis had turned a bit to the right and followed Dæhli instead of Kyburz’s group on the last long leg, a medal would probably have been possible for the Latvian team. But trying to keep up with Kyburz’ group’s speed was too much for the Latvian on the last leg. Sweden did a good relay until Gustav Bergman started the long leg on the last leg of the relay. Especially impressive was Bergman’s first few controls where he run fantastic on the longer forking to the first/second control. 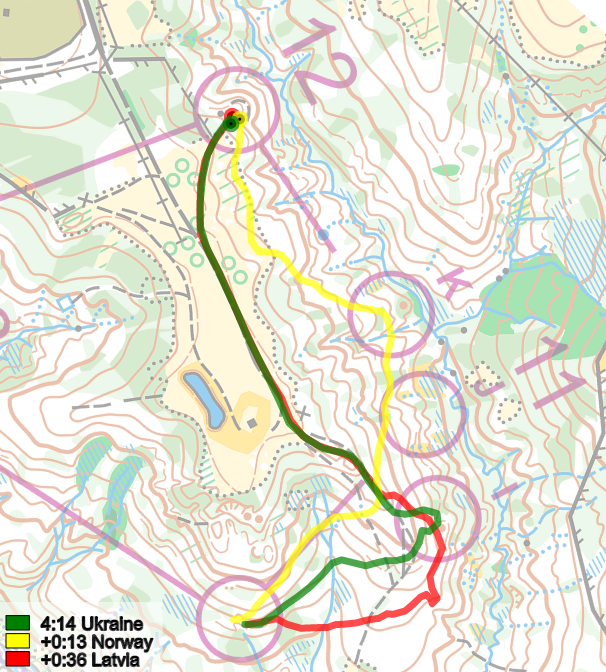 But then on the long leg after having nearly caught up with Kyburz’ group, he started to get defensive and got desperate, thinking that he needed to take another routechoice than Kyburz & Co in order to have a chance for a medal. His routechoice was one of the worst of the day, sending Sweden down into 9th place. Finally a quick look at the course and the forkings. Overall this was a good and interesting course, although it on first sight looks quite strange with some very easy controls both at the start and the end. It turned out that the easy controls in the end actually got decisive in the women’s class due to mistakes and hesitations by Tove Alexandersson – under high pressure and at high speed, even beginner controls can get tricky for anybody. Also, the first control is kind of banal, but as a setup for the forking it at least doesn’t work worse than running directly to a forked control. 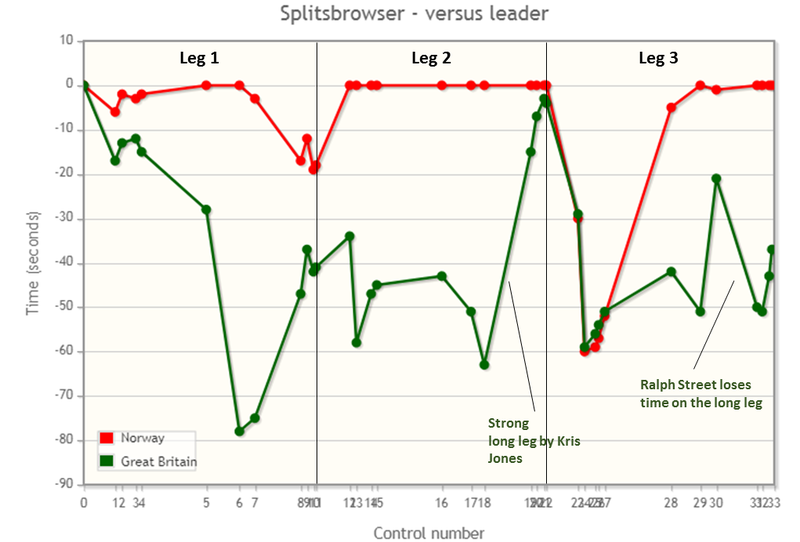 On the other hand there seems to be a 10-15 seconds advantage at having control A – although some teams manage to run B or C nearly as fast as A. Time-differences between A and B/C is 10 seconds on the first leg, 29 seconds on the second leg and 5 seconds on the last leg. The forking works very nicely on the first leg in that many teams lose half a minute by first going to D when they have E. There seems to be around 10 second time difference between forkings. A forking which worked very well was the forking between control 7 and 10. 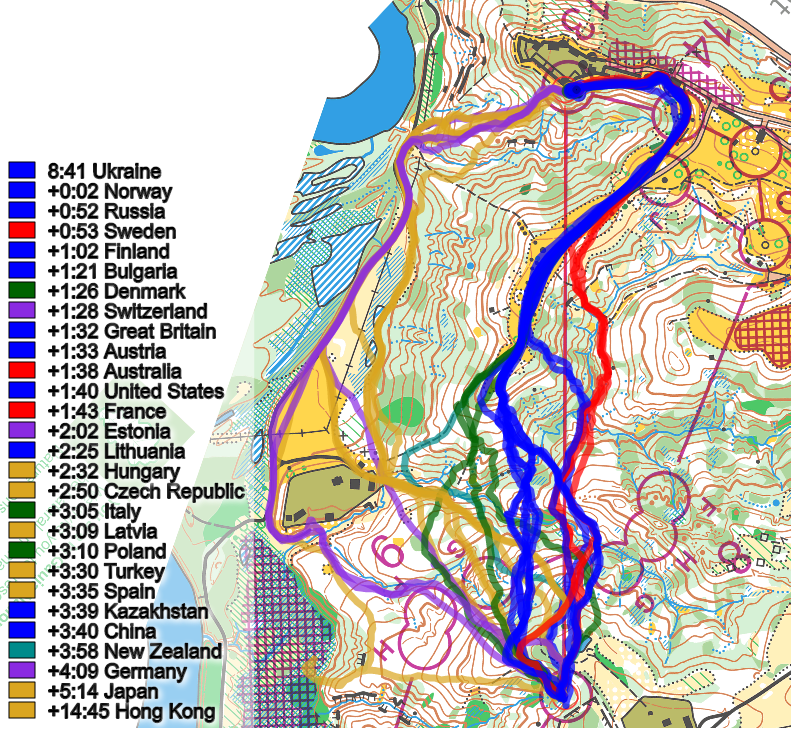 There seemed to be small time differences if performed well (with the middle G-control being some seconds longer), with tricky orienteering and easy to go with a wrong group and lose some time. Below the first and last leg runners are shown. Another forking which worked very is control 10-12. Again several mistakes, several runners going to the wrong control. Control I seems to be around 10-15 seconds faster if well executed, but not many execute it well. Many do mistakes at control I. The long leg was definitely the most interesting of the day, where several runners in the top teams did wrong routechoices which cost them important time. On the last leg it was very exciting to see which choice the different teams took. In the end there was no big difference in going straight/right and left as long as you executed well, but there were many different options to do wrong here, as you can see below. A simple forking out in the open. From the first leg it might seem that there is a time-difference of around 10-12 seconds here, but it looks like the time difference may be shorter than this if executed well. Finally a quick look at the women’s long leg. 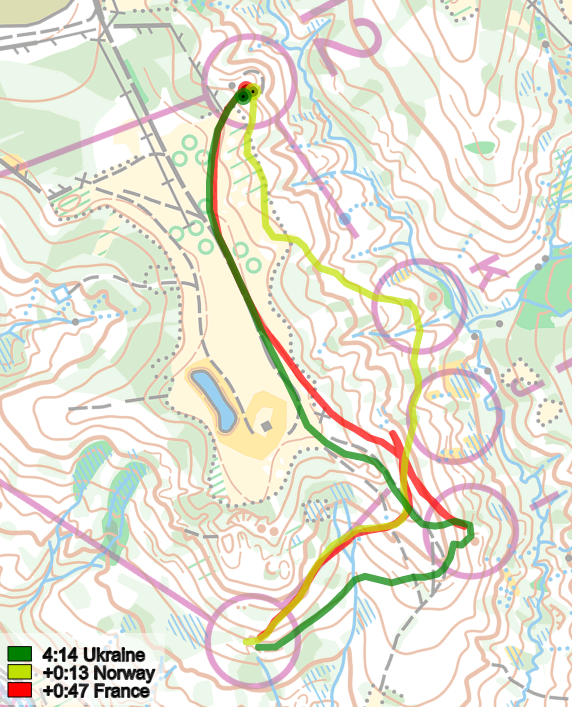 This leg is similar to the men’s but here the road-choice is definitely somewhat slower, and the best route is maybe a bit more tricky to execute and find. A very nice leg this also. What about long leg in the women’s course. 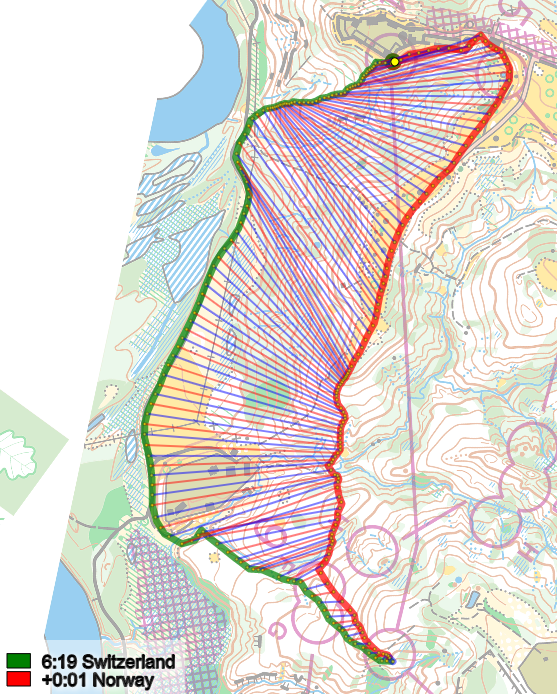 I can see one routechoice, that nobody took and I’m not sure that course setter saw it too. Going all around on paths through the right side through the arena could be the fastest one because of no climbing at all and not SO big length. Any opinion?